A classic recipe the impress as a special dinner party dessert! 1. Sift the flour and salt into a mixing bowl. Add the butter to the flour and then rub between your fingertips until a fine breadcrumb consistency is achieved. 2. Wrap the dough in cling film and allow to rest in the refrigerator for 30 minutes before using. 3. Preheat the oven to 190 C and grease a 22cm/9in fluted loose-bottomed tin. Place the tin onto a baking tray. 4. Roll out the pastry until it's big enough to generously fit the tin, leaving excess pastry falling over the sides of the tin onto the baking tray underneath the tin - don't trim at this stage. 6. To make the filling, place the lemon and lime juice, zest and sugar in a pan and heat until the sugar is dissolved. 7. Mix the cornflour to a paste with 3 to 4 tbsp of the water and add to the juice in the pan along with the remaining water. Bring to the boil, stirring all the time. 8. Cool slightly and whisk in the egg yolks and butter. Pour the filling into the pastry case. 9. To make the meringue, whisk the egg whites until they form soft peaks, then add one third of the sugar. Whisk for a further minute and add a third more sugar. Whisk for another minute and add the last of the sugar. The mixture should be smooth, thick and glossy. 10. Spoon the meringue over the filling covering it completely, then swirl it with the back of the spoon. Bake for 10 to 15 minutes until the meringue is golden. 11. 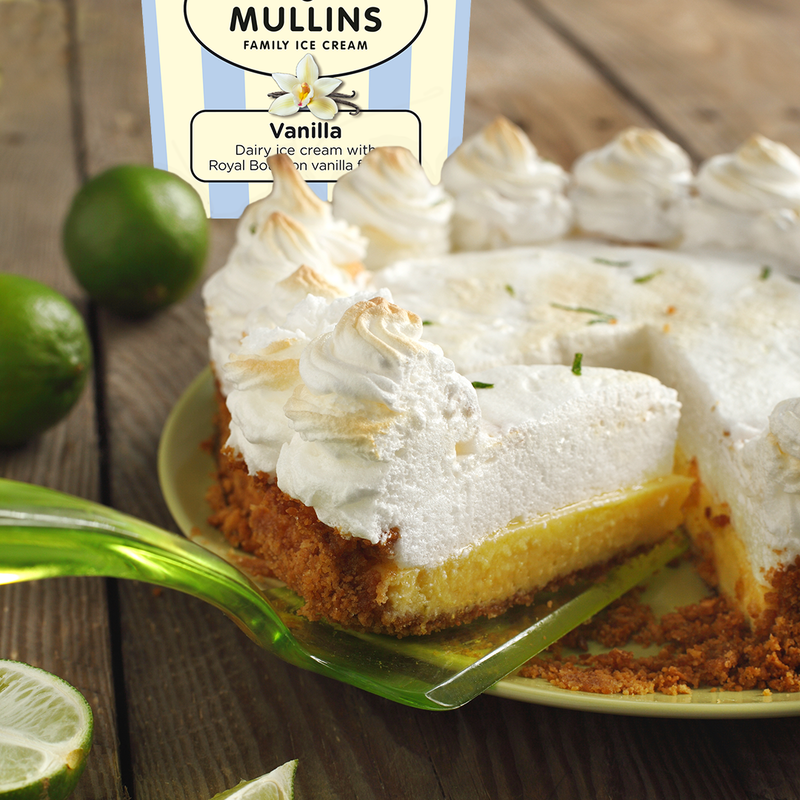 Serve with your favourite Mullins Ice Cream!